Brazil is one of the most fun and fascinating places to visit, and offers tourists so much diversity. Afterall, it’s the fifth biggest country in the world! The locals are friendly and laid-back, as is the dress-code, but there are a few essentials you’ll wish you’d remembered to pack for Brazil! Copacabana and Ipanema beaches are two of the most famous in the world, and the dress-code is: ‘the smaller the better’! #1 Casual clothing – The dress-code in Rio is fun and casual, so you’ll fit in perfectly in your bright swim shorts and havaianas. Even on an evening the dress-code is fairly casual, although you may want to go the extra mile if you’re eating out or going to a club, but you certainly won’t feel out of place in summer clothes. #3 The correct plug adapter – The plug sockets vary throughout Brazil, so a multi-country adaptor is your best bet. However, in places like Rio that have the European 2-prong plug, be aware that you’ll need a small adaptor as the pins are often sunk into the wall too far for a multi-country adapter. #4 A secure bag – Ensure your bag has a zip or secure fastening, as the streets are busy and pickpocketing is something to be aware of. A bag that crosses your body or can be worn on your front is particularly useful when using crowded public transport. Check out our Rio Safety Guide for more tips! #5 Sun protection – During the summer and the shoulder seasons it can get extremely hot, so lightweight, loose-fitting clothing in natural fabrics is best. Sunglasses and sun cream are an essential to pack for Brazil, and you should consider a hat too if you are sightseeing for hours at a time, as it can be hard to escape the sun. #6 An extra layer for indoors – In hotels, shopping centres and restaurants the air conditioning is often turned up so high you’ll wish you had a jumper with you! So a small cardigan or sweater is a good idea, and you can also use it as a cover up on the beach. #7 A Sarong – A beach towel isn’t necessary in Rio, as the locals tend to use sarongs or scarves to sit on, and go in the sea to cool down rather than to swim. Similarly, try to take as little as possible with you to the beach, as you’ll feel out of place with a bulky bag, and there are plenty of places to get cheap drinks, snacks, sunglasses, hats (literally everything you’d possibly need! ), right off the beach. 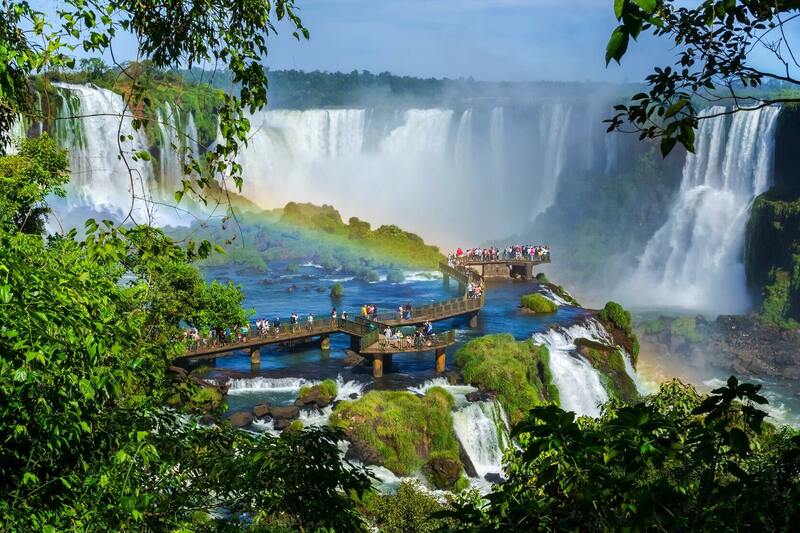 The breathtaking Iguazu Falls is a highlight of most trips to Brazil! #8 A waterproof – When considering what to pack for Iguazu Falls, a waterproof coat or a poncho should be your at the top of your list. You’ll DEFINITELY get wet, whether you want to or not! The falls are some of the largest in the world, and the spray from them will soak you after a while, especially if you’e doing a boat trip. #9 Sensible shoes – Similarly, your shoes may also get wet, so lightweight, quick-drying trainers or sturdy sandals are perfect. Also remember that you’ll be covering a lot of ground as you explore the falls and the national park. #10 Passport and visa – Most visitors explore both the Brazilian side and the Argentinean side of Iguazu falls, so don’t forget your passport on the day you cross the border! Also, check if you require a visa before you travel. #11 Mosquito protection – The hot, humid weather conditions are perfect for mosquitos, so cover yourself in insect repellent with DEET in it, and wear long sleeves if you want to avoid getting bitten. Wherever you’re going, insect repellent is an essential to pack for Brazil. #12 A decent camera – The falls are not the only things you’ll want to photograph, as the national park is full of beautiful wildlife, including the very cute and friendly coatis, as well as many brightly coloured birds and butterflies. It’s one of the best places for wildlife in Brazil, outside of the Amazon and Pantanal. Popping to the shop just isn’t an option in the rainforest, so make sure you don’t forget anything. #13 Walking boots – These are the best type of footwear for the Amazon, as you’ll need comfortable, sturdy shoes for walking in, that will also protect your feet from stinging/biting insects and muddy, wet terrain. #14 Extra insect protection! – Mosquitos can be a real problem in the jungle, so a good quality insect repellent is essential, and you might even want to consider packing a plug-in deterrent as well. Long-sleeved tops and trousers are even more important in the jungle, and in case you do get bitten, take an anti-itch cream and antihistamines in case you have a reaction to the bites. #15 Extra clothing! – The rainforest can get extremely humid and you’ll get dirty very quickly, so taking extra clothing is essential. Thin layers and things than fold up small are perfect, as you won’t want to take too much luggage with you into the jungle. 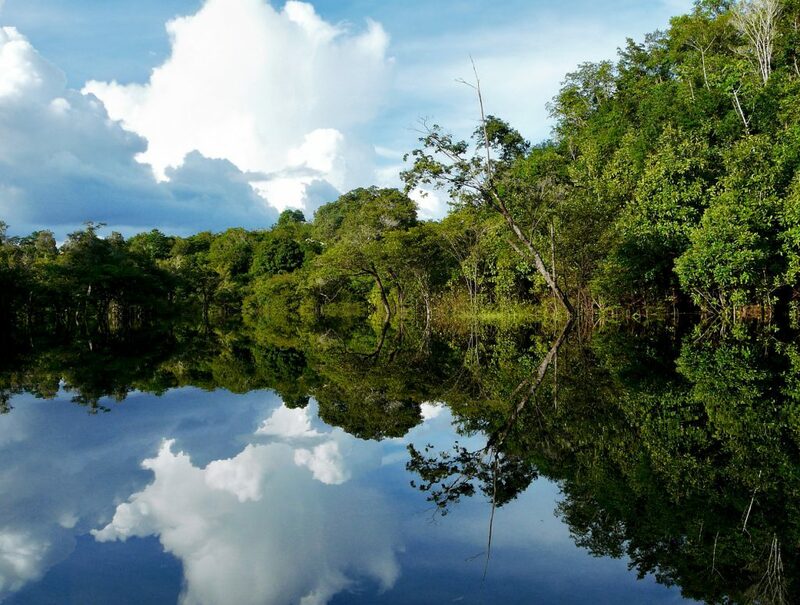 #16 Medication – The lodges in the Amazon are well-equipped with first aid kits and trained first aiders, but you may want to take certain medications, like pain killers, antacids, throat lozenges etc. as you won’t be able to buy any while you’re there. #17 A Torch -Finally, a torch is a great additional item for your Amazon Rainforest packing list, as the jungle comes alive at night so it’s the perfect time for wildlife-spotting! 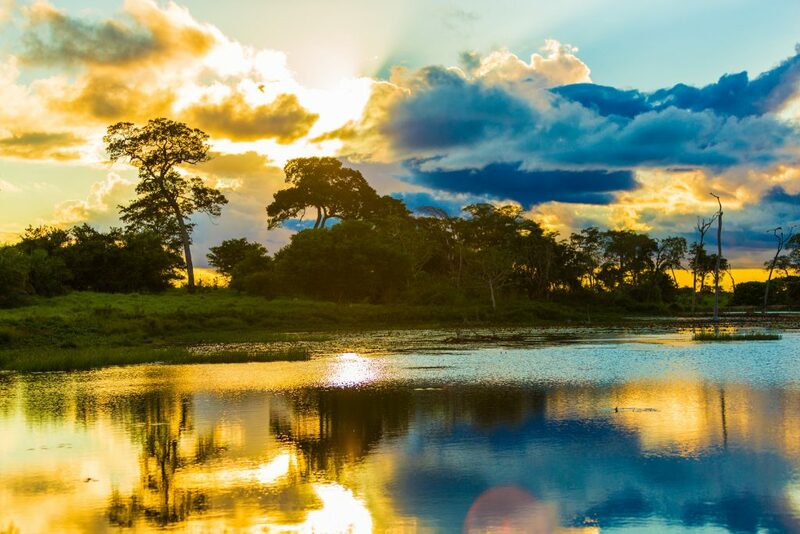 The Pantanal is home to the world’s largest tropical wetland. #18 Stretchy or loose-fitting trousers – Most of the activities in the Pantanal involve walking, horse-riding or canoeing, so having the appropriate clothing is essential for your enjoyment. #19 A reusable water bottle – Fresh, clean drinking water is supplied in most lodges, so it’s a good idea to bring your own bottle which you can fill up. #20 Binoculars – Unlike the Amazon, the Pantanal is open plains and swamps, so wildlife-spotting is much easier, but often you’ll be positioned too far away to get a good view! #21 Warm clothing – The temperatures can really drop on a evening, so a thin fleece is a good additional to your Pantanal packing list. 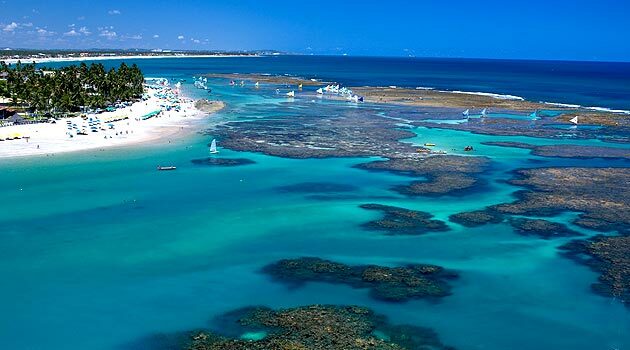 The reefs at Porto de Galinhas form a natural barrier, so the waters are warm and the fish are plentiful! #22 Snorkel equipment – The northeast coastline has the best snorkelling in Brazil, and some of the best in the world, so don’t forget your snorkel mask or goggles! The reefs around Porto de Galinhas and Fernando de Noronha especially are not to be missed. #23 An underwater camera – Sand in your lens is best avoided, so an underwater camera or waterproof camera case is a good idea for beach days and snorkelling. #24 Flip flops! – The weather up north is always warm, and the only time you’ll want close-toed shoes is if you go out on a night. Don’t worry if you forget your flip flops, as Brazil is the home of havaianas, and you’ll find places selling them everywhere you look. #25 Long-lasting sun cream – The equator runs right through the north of the country, which means more you’ll burn much quicker. The sea is warm too, so you’ll be in and out all day whilst on the beach, so a strong, long-lasting sun cream in a high factor is advisable. 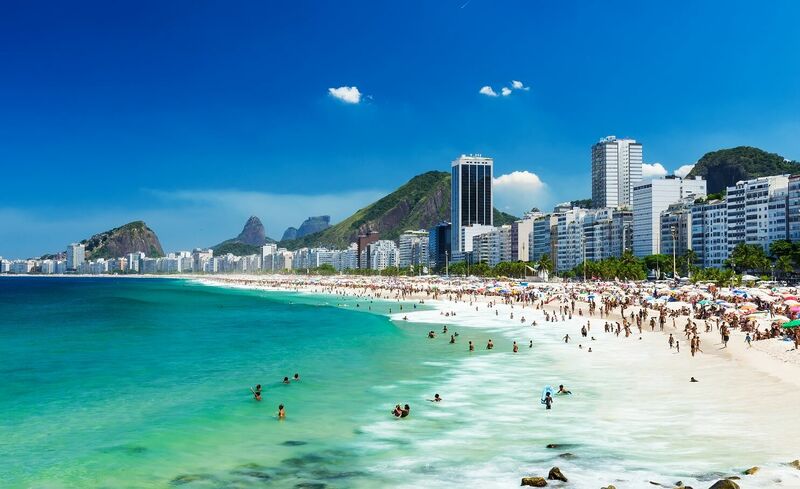 Sun cream is an essential to pack for Brazil no matter where you’ll be visiting.